In Belgium the libertarian left of the 21st century could be described as a movement in which the ideologies of those active in its main center, the Anarchist Center in a big city called Gent, are very important. This place is in the north of Belgium, not far from the border with The Netherlands. "The Anarchistisch Centrum is a meeting place for individuals and groups active in Gent with anarchism and/or direct action. Anarchism means for us that we want to work in an anti-authoritarian way at an ecological society in which all power is equally divided." I think anarchism of the now in Belgium is a lot like that of Sweden, but with less syndicalist influences and a lot more people interested in squatting, because the laws around it are not that strict here. 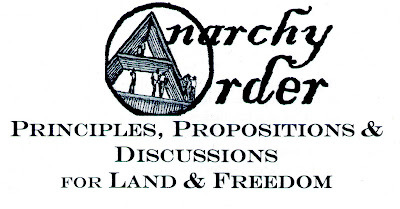 Two people have started this year with a journal called "Anarchy is order". Two issues of it have appeared already and they have been active as a collective that distributes alot of radical writings, digital and non-digital. They clearly have been inspired by writers like Chaz Bufe, Peter Kropotkin and Murray Bookchin. Their website is almost fully in English.